The first restaurant we went into during our December Baguio trip was the The Outlook Steak & Grill, located at Grand Sierra Pines Baguio, a few steps away from The Atrium Lobby Café. Offering a wide selection of Western dishes, The Outlook Steak & Grill is notable for its sous vide steaks. 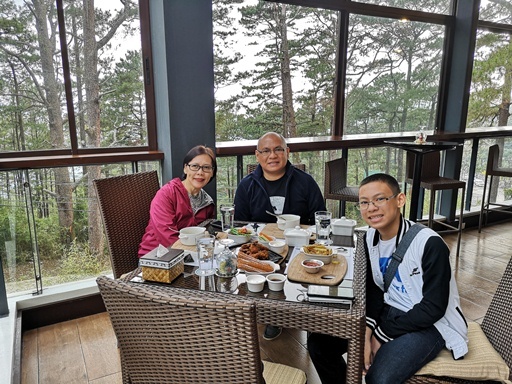 The restaurant gives a breathtaking view of the hotel (Grand Sierra Pines Baguio), as well as Baguio’s towering pine trees. 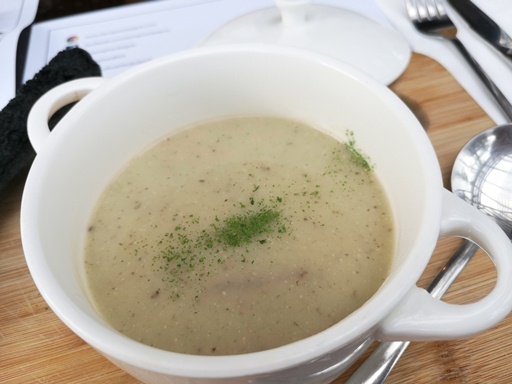 This smooth and creamy Black Truffle Soup was so heartwarming! Perfect for the chilly Baguio weather and best paired with the flaky black Cubano! Our ever-predictable son, who loves French fries, ordered Truffled Potato Fries. 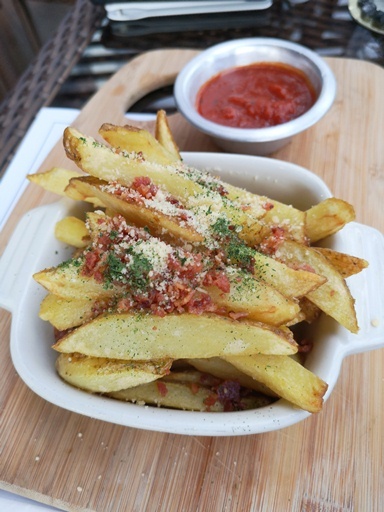 These are fries and bacon bits dressed in truffle oil and grated parmesan. Despite its promising looks, Justin wasn’t able to finish this because he’s not really used to having fries with truffle oil. I guess he needs time to get accustomed to its taste. 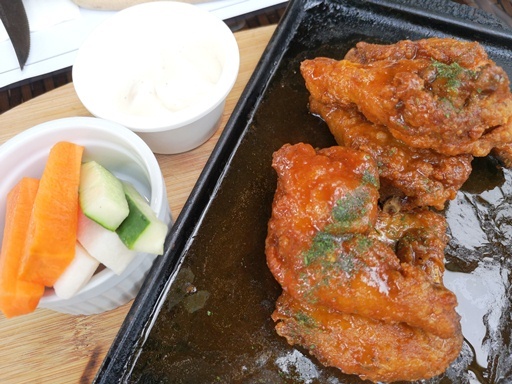 These Buffalo Chicken Wings are sweet, tangy and spicy crispy fried chicken, served with cucumber, carrot and jicama (singkamas) sticks with garlic ranch dip. Well, what do you know! The platter was wiped clean; nothing remained, not even those veggie sticks. Yay! This Angus Beef Salpicao is hubby and my’s hands-down favorite! 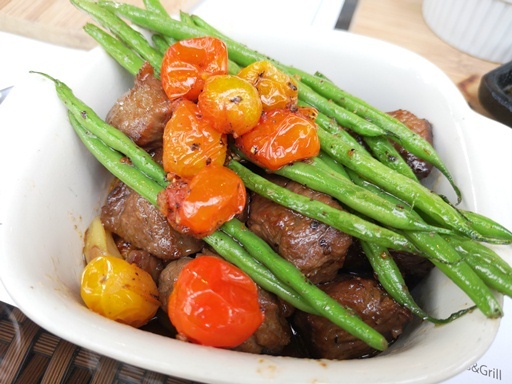 It’s stir-fried beef in olive oil and garlic with Worcestershire sauce, cherry tomatoes and French beans, served with rice pilaf. The beef was tender and savory. I loved the crispy French beans, too! These Churros sure are crunchy! Plus, it comes with two sauces: hot choco and cream cheese, so take your pick! 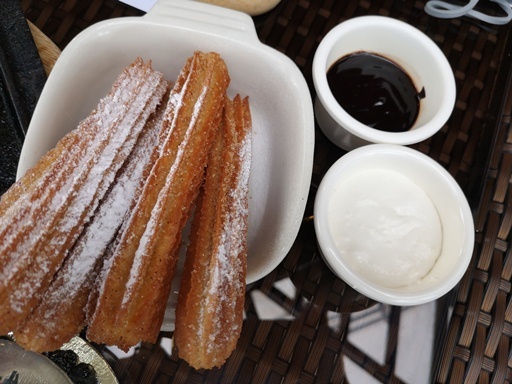 Personally, I prefer hot choco over cream cheese for my churros. If you happen to be in Baguio and you’re looking for a place to experience good food and great ambiance, I recommend you try The Outlook Steak & Grill. This entry was posted in Baguio, Baguio Trip 2018, The Outlook Steak & Grill. Bookmark the permalink.